New Year’s Six on ESPN Deliver Strong TV and Digital Audiences - ESPN Press Room U.S.
ESPN’s second presentation of the New Year’s Six (Chick-fil-A Peach Bowl, Capital One Orange Bowl, Goodyear Cotton Bowl Classic, BattleFrog Fiesta Bowl, The Rose Bowl Game Presented by Northwestern Mutual and the Allstate Sugar Bowl) averaged a 7.1 overnight rating, with four of the six games experiencing ratings increases (bowl to bowl and time slot to time slot) from last season’s inaugural year. On WatchESPN, the New Year’s Six experienced significant increases across the board, in all metrics, continuing a trend experienced all college football season. Digitally, the New Year’s Six averaged 200,170 average minute impressions, 776,000 unique viewers and 43,871,000 total minutes for the six games, up 69%, 54% and 67% in each category, respectively. The 7.1 overnight rating average for the New Year’s Six – in which average margin victory across the six games was 24 points — is down 13% from last season’s 8.2. The four bowls which were not designated as a semifinal this season (Peach, Fiesta, Rose, and Sugar) averaged a 5.8 overnight, up 26% from the four bowls last season which were not semifinals (Peach, Fiesta, Orange and Cotton). Four of the New Year’s Six bowl games saw ratings increases from their same bowl last year (i.e. Cotton Bowl vs. Cotton Bowl), including the Fiesta Bowl featuring No. 8 Notre Dame vs. No. 7 Ohio State (New Year’s Day at 1 p.m. ET), which earned a 6.2 overnight, up 35% from the Fiesta Bowl last season. As previously documented, the Orange Bowl was up 102%, Cotton Bowl up 87%, and Peach Bowl up 21%. The Rose Bowl Game featuring No 6 Stanford vs. No. 5 Iowa earned a 7.9 overnight, while the Sugar Bowl featuring No. 16 Oklahoma State and No. 12 Ole Miss had a 5.3. 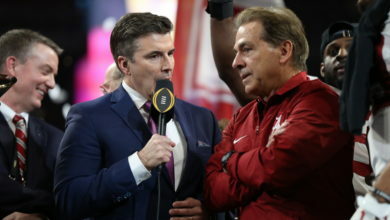 Four of the New Year’s Six also saw ratings increases from their corresponding time slots last year, including the Fiesta Bowl which was up 17% from the 2015 New Year’s Day early afternoon game (Cotton Bowl). As previously documented, the Orange Bowl was up 111% from the 2014 New Year’s Eve late afternoon game (Fiesta Bowl) and the Cotton Bowl was up 106% from the 2014 New Year’s Eve prime time game (Orange Bowl). The Peach Bowl was played in the exact same time slot both years (early afternoon New Year’s Eve), so the ratings increase of 21% mentioned above remains consistent. Birmingham was the highest-rated market across the New Year’s Six, with a 23.6 average rating for the six games. Rounding out the top 10 markets were Columbus (17.3), Tulsa (14.1), Oklahoma City (14.0), Greenville (13.8), Dayton (12.7), Cleveland (12.3), Knoxville and Nashville (12.2), and New Orleans (12.1). Columbus was the highest-rated overnight for the Fiesta Bowl with a 34.9 rating, the market’s third-best overnight for a non-Championship college football bowl game on ESPN. Cleveland was second with a 25.0 overnight, the market’s second best overnight in the same category. On WatchESPN, the 2015 Fiesta Bowl was the most-streamed Fiesta Bowl ever, setting new record highs in all major metrics: 159,000 average minute impressions, 693,000 total unique viewers and 35,822,000 total minutes.